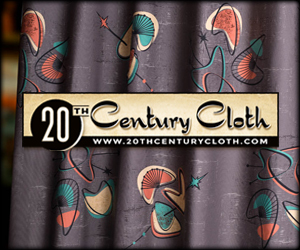 Welcome to this week’s Mid-Century Menu! 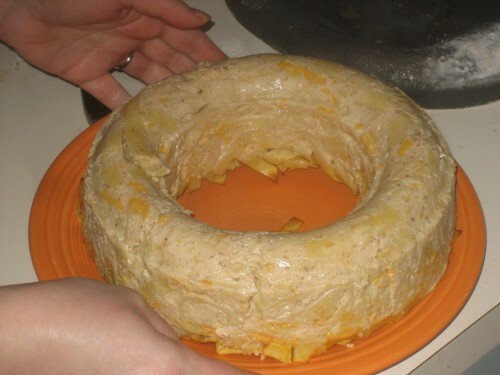 After last week’s Jellied Egg debacle, I am happy to report that this week there is not a bit of gelatin to be found in any of the dishes this week. At all. Thank goodness. That being said, it doesn’t mean this week’s menu is any less scary looking. There is just no gelatin in it. 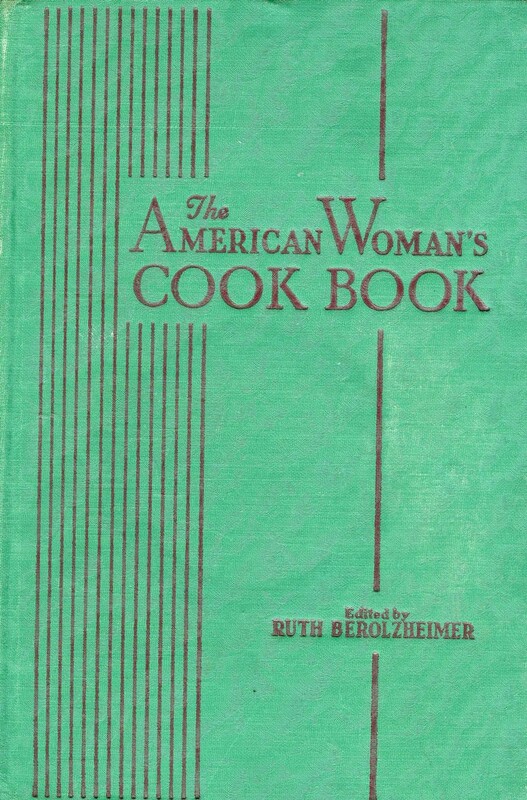 This week’s Menu comes from The American Woman’s Cook Book, which was published in 1948 by the Culinary Arts Institute, which published a TON of cookbooks from 1930-1960. 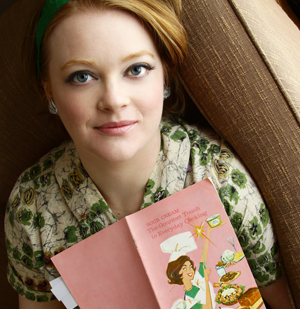 From the notes inside the book, this is an edited version of an earlier cookbook, called the Delineator Cookbook, which was published by the College of Home Economics at Cornell University. 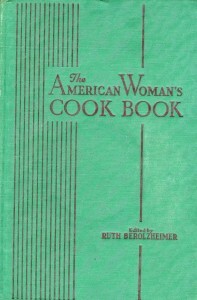 It doesn’t say what year it was originally published, but from the recipes in the book I think it was the 1930’s or even earlier. 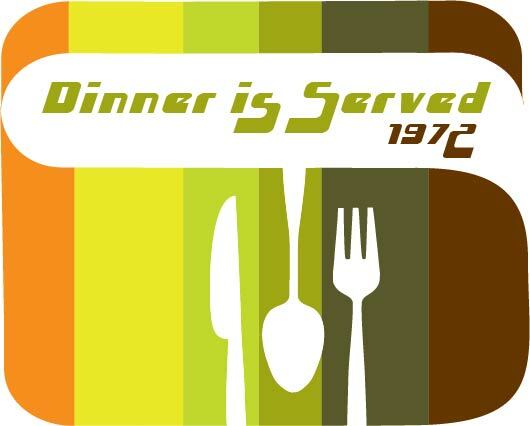 Tom actually got this book from one of this co-workers, who have all heard of the Mid-Century Menu and are happy to provide more fodder for the weekly Menu, even if they do think I am a little crazy. In any case, for this week’s Menu I scanned the book and picked out the most intriguing offerings the book had to offer. Mmmmm…tasty! Right? Right? Just look at it, laying there and glistening on the platter. 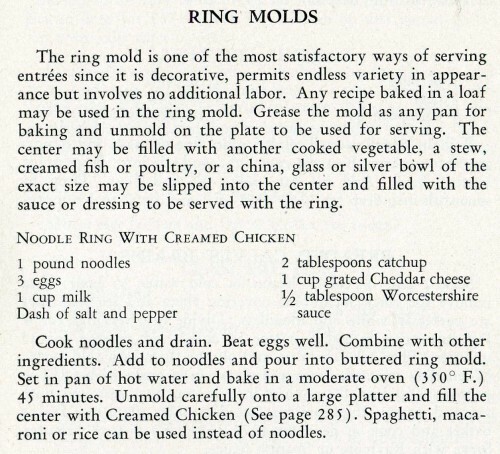 “The ring mold is one of the most satisfactory ways of serving entrees.” Really??? 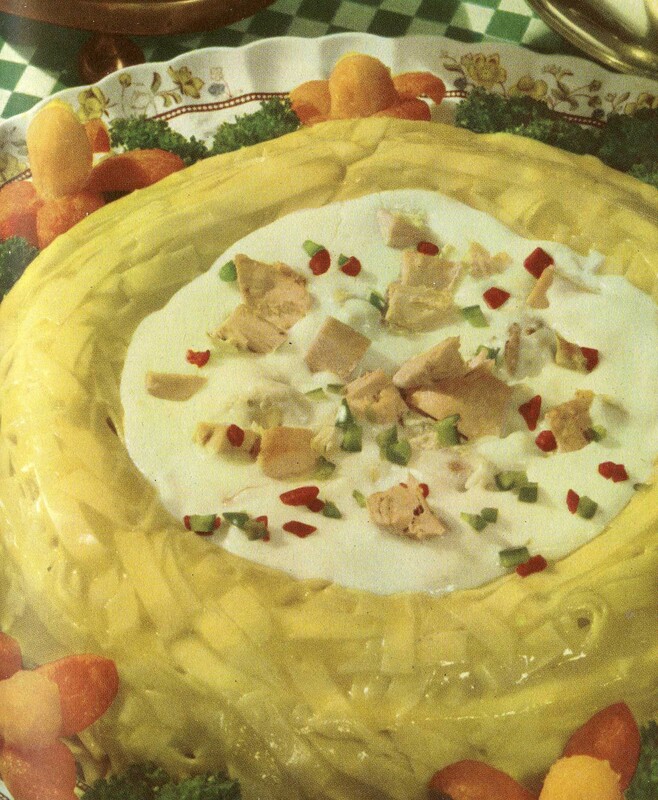 The ingredients for the creamed chicken and the noodle ring. And yes, the things on the saucer are chicken pieces, even if they don’t look the best. 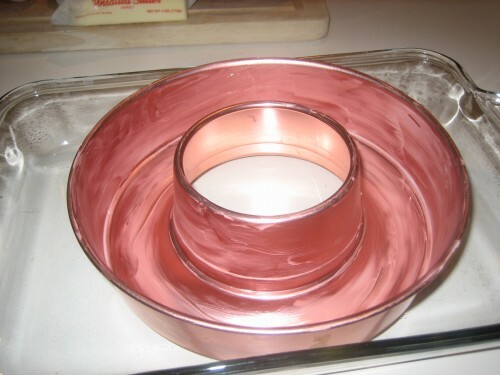 First things first, here is the ring mold all buttered up. I was pretty pleased with myself about this one, Tom and I looked for one for weeks before I finally found it at the local Goodwill. Score! 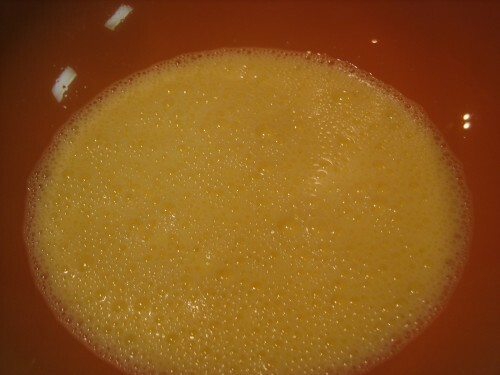 Here are the eggs, whisked in with the milk. It is a pretty yellow, right? Not anymore! Here it is with all the other ingredients mixed in, including the ketchup and Worcheshire sauce. Ugh! Puke brown. 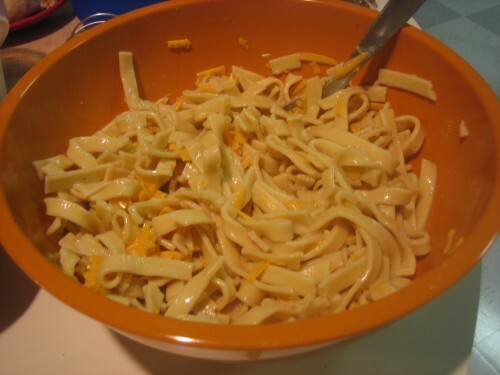 Here it is will all the noodles mixed in. Mmmm…slimey. And now, packed into the ring. Let me tell you something, trying to pour a slimey noodle mixture into a round pan with a hole in the center is NOT fun. I didn’t get a picture of the mess I made, but trust me, it was huge. After I crammed the noodle ring into the oven, I started on the white sauce for the creamed chicken. 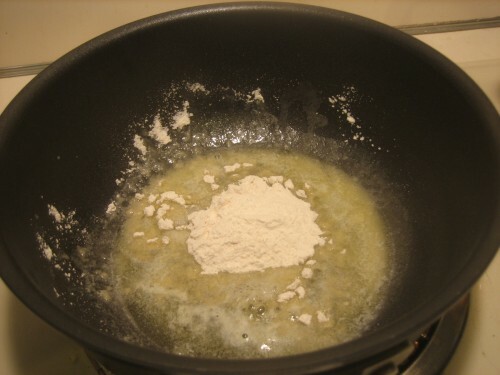 Here the flour is getting cozy with 2 tablespoons of butter. 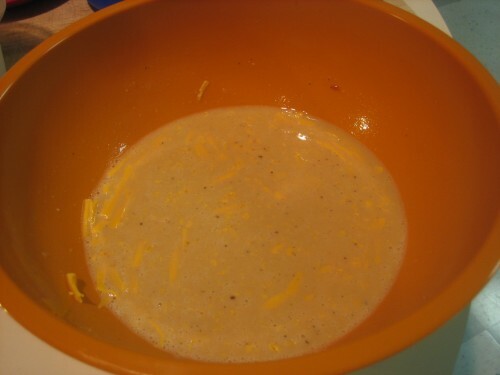 Here is the sauce after the milk was added, bubbling away and thickening. Here it is after adding the chicken and the parsely. And yes, I did forget to add the egg yolk at the end. Gah! 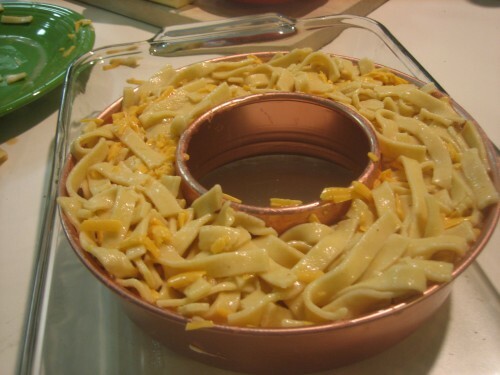 The noodle ring, “fresh” from the oven. I am so freaking happy that I was able to unmold it in one piece. I was jumping up and down with it and swearing about a minute before this picture was taken, but I finally was able to shake it out. 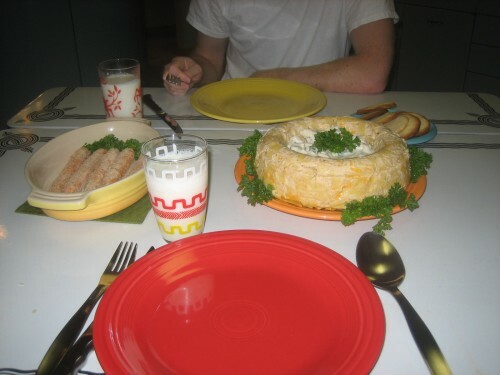 Here it is, filled with creamed chicken and ready to be served! Ta-da! Stupid thing, I don’t care what that recipe says, it was a pain! Here is the table, all set and ready to go. 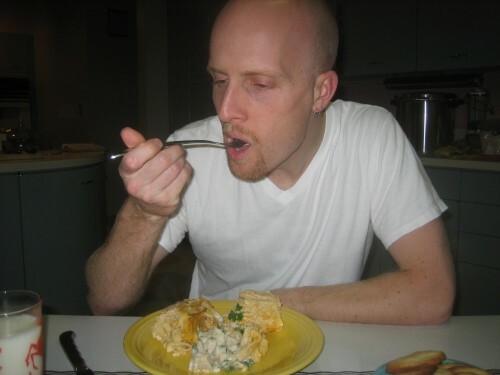 You can see how eager Tom is to dig in, he already has his fork in his hand. I took a bite. Hmmm…it didn’t taste like, anything. Mostly just noodles. The creamed chicken was a little better, but still didn’t taste great. 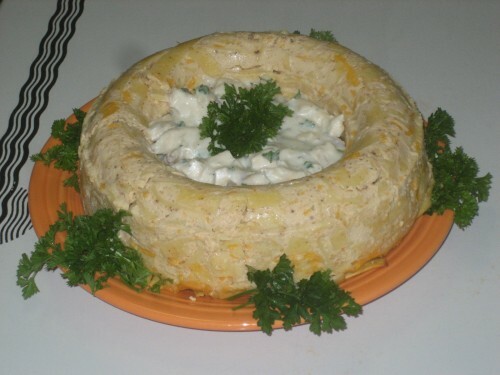 Noodle Ring: Chewy and bland. Not much going on tastewise. 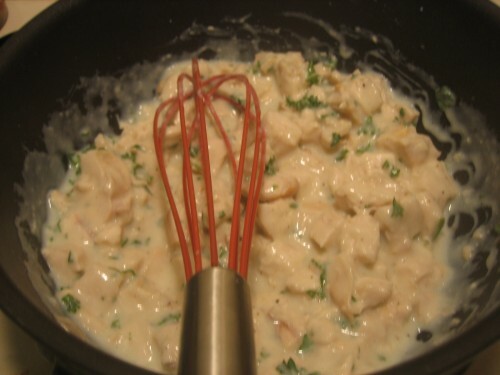 Creamed Chicken: Pretty good. Would have been better with bread of some kind. Toasted Carrots: Tasted like carrots with breadcrumbs on them. Almond Cookies: Really, really good. I would have to say they were excellent. I am adding them to the Christmas Cookie list for this year. 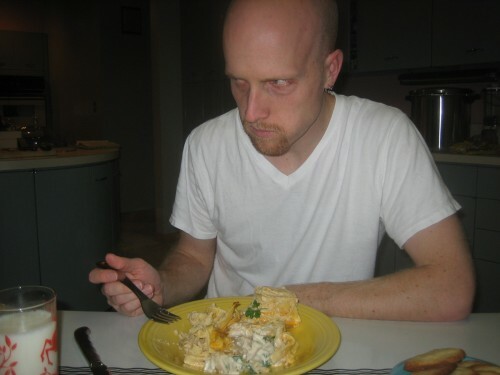 Tom ate the whole plate! I just think it’s sweet that you guys have a glass of milk at every meal. 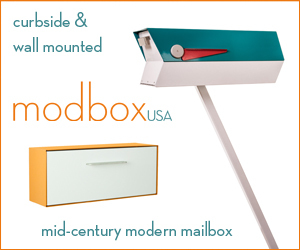 At least the noodle mold looked cool! Tom looks mad in that second picture! Poor guy. I cannot even really picture what ketchup and worcheshire would taste like together, but I guess it is pretty bad from the way this turned out. I’ll have to try those almond cookies though, they sound very good! LOL@ Tom’s “look”! Yes, Sara, he DOES look mad! 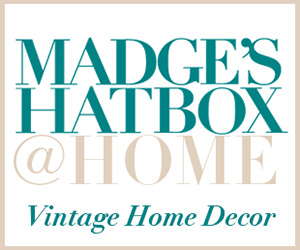 Maybe stark raving mad and not angry mad, eh? When I saw the title of the menu, I thought that creamed chicken and noodles don’t sound bad (silly me) until I read further. 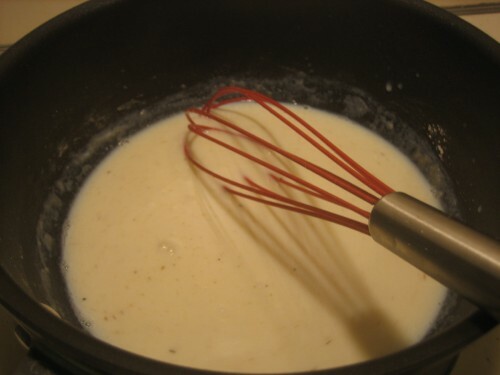 Have to say, Ruth, you are the white sauce maven, what with almost ALL of the recipes having white sauce in them! I won’t go there with the toasted carrots. 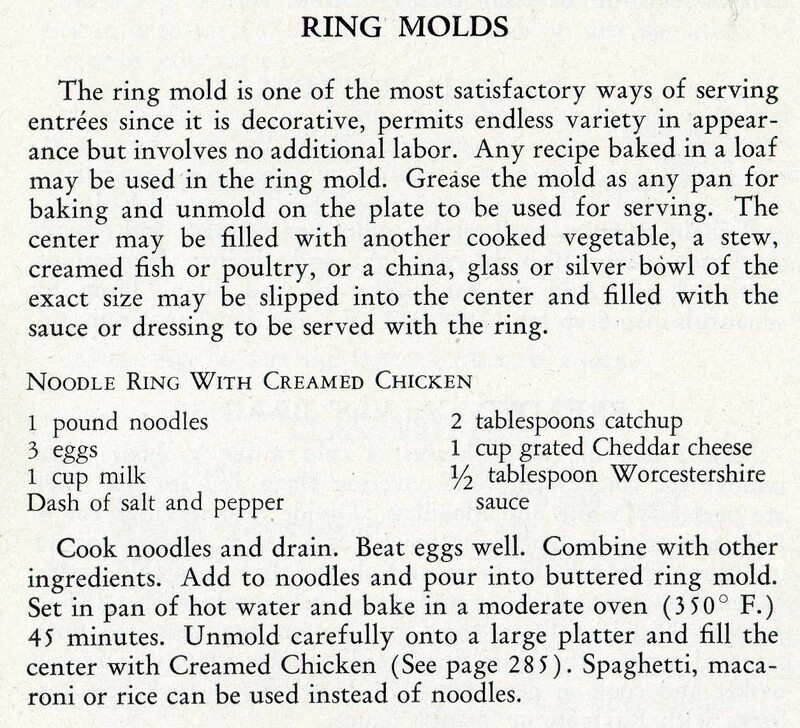 As for the blandness, It seems if you ate the cream of chicken as sauce for the noodle-ring it’s be better, but I have no idea how it was meant to be. Or did you? 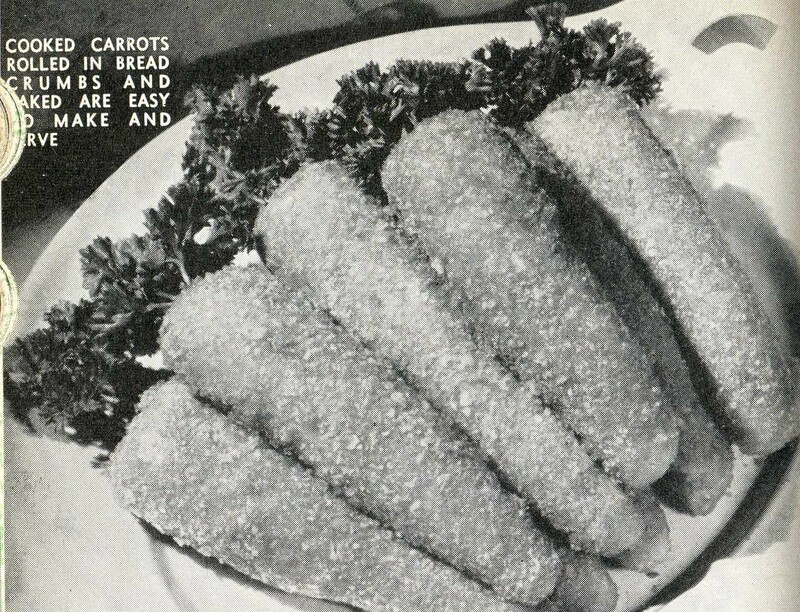 I love old recipes. 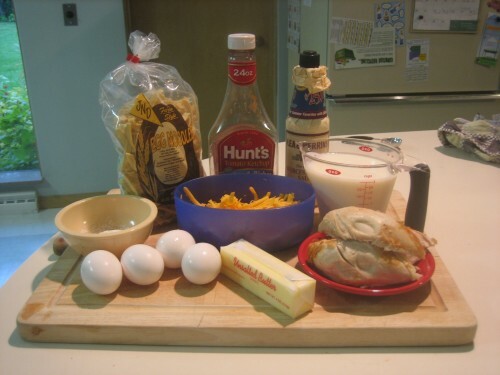 Your recipe differs from the one mother and dad passed on to me, egg noodles, 3 eggs, milk or cream salt and pepper, Serve with peas and carrots, Chicken, Beef…. served in center! DELICIOUS! I love the almond cookies that you find at Chinese buffet restaurants. Yummy!